Elements of a Voluptuous Beauty: Orange you orange? Your problem may not be the problem; it might be your attitude towards your problem. Hey Beauties!!! What a great day today. 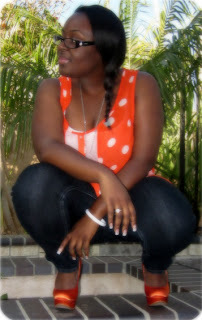 Sun was out and shining, a lil cool breeze...oh just beautiful. And I went Shoppingggg!!! lol Got two new GOODIES today....I love the pattern and colors of both and I already have an outfit in mind. Yippee!! just have to wait till I post them up! Today was pretty laid back...stores I visited were Target, G-stage, Ross and F21 (didn't have enough time to really look around...I'll have to go back later). My Zumba class was earlier today...so I didn't have time to do everything I wanted to do. Like hit the thrift stores, so I'm reserving that for tomorrow. On a side note...two of my family members left today for a mission trip to Haiti. So I pray they have safe travels and hope they help as many people as they can. As for me, I was schedule to go but because of some "family drama" I chose not to. I didn't think it would be fair to everyone else because I wouldn't be myself and I wouldn't be able to help efficiently and effectively (I need to work on not having other's thoughts affect my mood and keep me from what I have to do). But I do have a chance to attend another mission trip to Costa Rica in June. So I need to start saving!! Pray for me please. 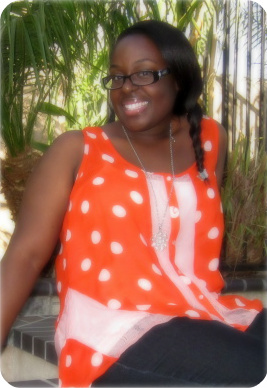 Countdown: 5 more days till my birthday!!! YAY. I thought I found the perfect dress...but Idk...it seems like there's something else out there...we'll see though. Still searching! Today's outfit was actually inspired by my friend. I've been wanting to wear orange lately and I found this perfect top at Charlotte Russe for only $10.00. Great buy right? 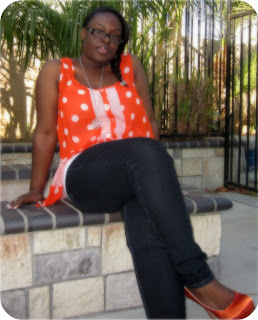 lol I luv the polka dots and its chiffon which is great for upcoming spring weather. 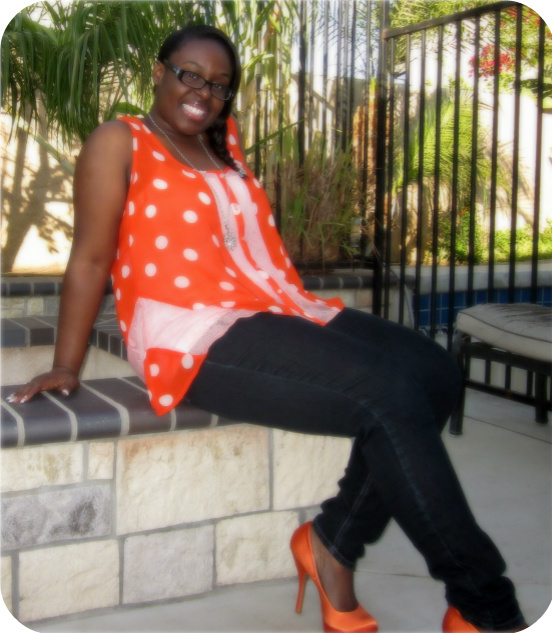 I paired it with dark skinny jeans from G-stage (fav lil boutique) and orange satin pumps. This is the first time wearing these pumps and you'll be seeing them a lot more :-) . 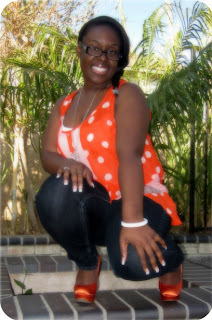 Told you I've been wanting to wear orange lately lol. 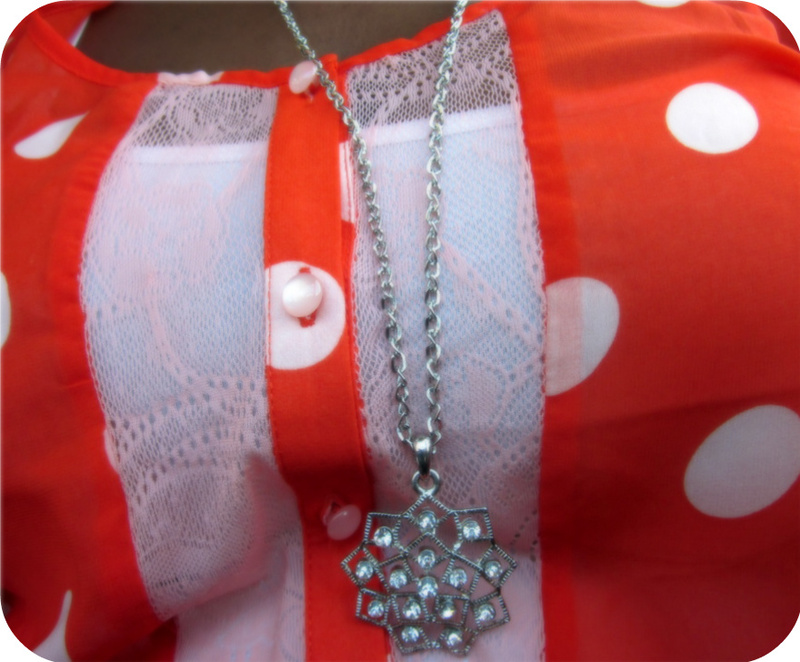 Basic white cami underneath, cant show the goodies you know :-p and a necklace gifted last year from a friend. Hope you guys like!!! Love the details of that top! Super cute! Awe. That brings a smile to my face. Thank you! !